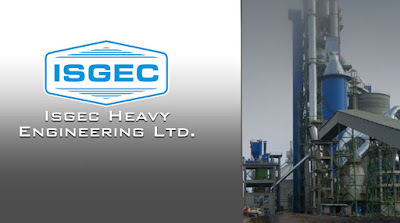 ISGEC Heavy Engineering is currently trading at Rs. 5348.85, up by 188.00 points or 3.64% from its previous closing of Rs. 5160.85 on the BSE.The scrip opened at Rs. 5300.00 and has touched a high and low of Rs. 5454.00 and Rs. 5300.00 respectively. So far 303 shares were traded on the counter. The BSE group 'B' stock of face value Rs. 10 has touched a 52 week high of Rs. 8400.00 on 15-Jan-2018 and a 52 week low of Rs. 4991.10 on 28-Jun-2018. Last one week high and low of the scrip stood at Rs. 5,454.00 and Rs. 4991.10 respectively. The current market cap of the company is Rs. 3919.60 crore. The promoters holding in the company stood at 62.27%, while Institutions and Non-Institutions held 8.93% and 28.80% respectively. ISGEC Heavy Engineering has emerged L-1 bidder (lowest) in reverse auction in order for Flue Gas Desulphurization (FGD) 3 units x 800 MW from NTPC - Kudgi Super Thermal Power Project. The value of the expected order is about Rs 700 crore.